This is another outfit that I never got around to posting a few weeks ago! I am feeling great! Pretty much back to normal! Although yesterday I may have over done it a little! I am supposed to be "taking it easy" but that is hard when I feel fine and there are so many things that I need/want to do! At the end of the day I am exhausted, but I am just so thankful that I am feeling myself! This week has flown by! I can't believe it is already Valentines Day. I am so excited because Matt is cooking me dinner tonight! We eat out so much that it is almost more special to stay in. We also just had our anniversary and we went to a really cool restaurant that we had never been to. So for Valentines day we decided to do something different and stay in. And when Matt said he wanted to cook (which he never does) I was all for it! Matt is cooking dinner and I am making dessert! I hope you all get to share today with the people that you love the most making great memories! Have a great weekend. Don't forget to enter the Happy wrist giveaway here. Love this color combo! That necklace is gorgeous! This whole looks is amazing!!! Love those pants SO much! What a cute outfit! LOVE the platform detail of those shoes!!! And sounds like a really nice V-day plan! It's all about spending time with the person you love! I have been struggling to figure out how to wear a turtleneck and statement necklace together so I am so glad you posted this. Adorable! I love grey it pairs so nicely with just about everything. Your look great! 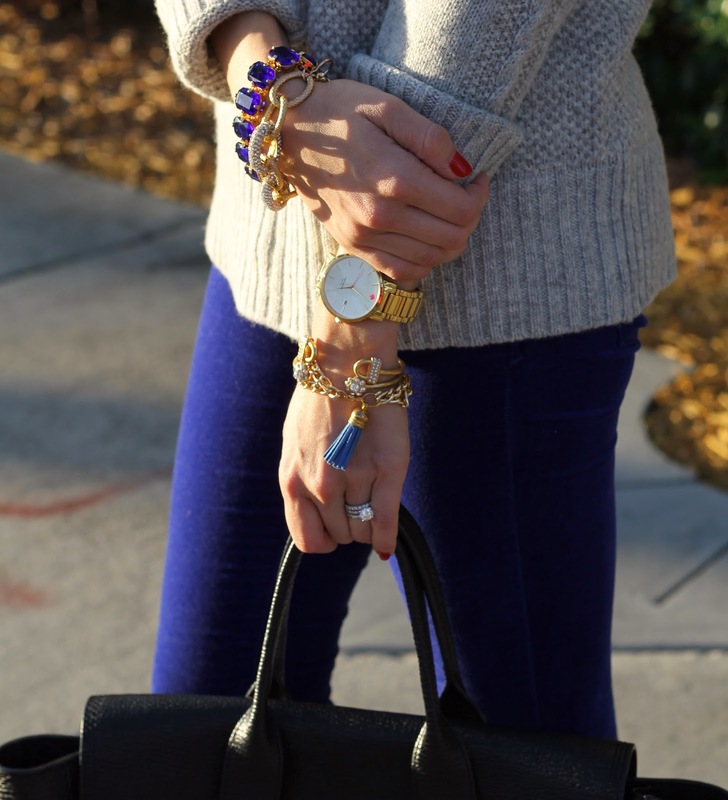 I really love the necklace atop the sweater, really adds a glam touch to the chunky knit! Gorgeous sweater! Sometimes staying in is better, especially when your man is planning to cook! Enjoy! Love the necklace layered with the turtleneck! i would have never thought of grey and blue together. you pulled it off well. cute necklace! You look so pretty and girly! I'm sure you had a great v day! so beautiful! it is great look ro wear everyday! Valentines day spent at home cooking is the best! This look is gorgeous, I love how it's casual glam. I'm so glad you're feeling better! Could you do a post on how to properly place extensions? So happy to hear that you are feeling back to normal. You look amazing. Awww hope you had a great Valentine's Day staying in. Love your hair, so pretty.